Thieves have stolen money that had been collected for an annual Christmas charity sit-out. They broke into a car at a garage in Camlough, south Armagh, on Friday and made off with the cash. 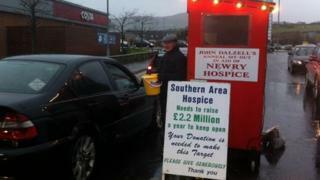 The money had been collected that day in Newry by a volunteer in aid of John Dalzell's 10-day Christmas sit-out for Southern Area Hospice. Now in its 22nd year, the campaign has raised a total of more than £1m.